Most landscapes have either too much evergreen foliage (i.e. 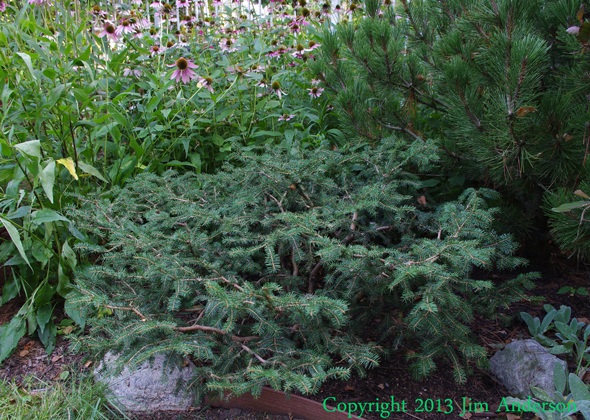 Blue Colorado Spruce taking up the whole front yard) or too little (perennial gardens). So what’s a gardener to do? How about instead of adding big spruce and pine trees that get too big, we add more evergreen shrubs to the landscape. 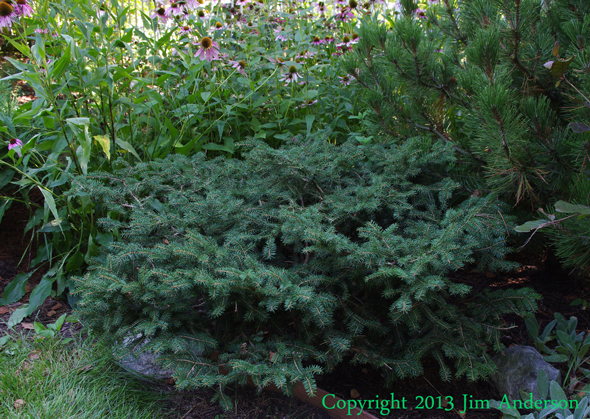 In a previous post, I answered a reader’s question about selecting an evergreen shrub to put as a foundation plant. In that post, I mentioned one of my favorite easy care plants. The birds nest spruce (Picea abies ‘Nidiformis’). I HATE SPIREA!, especially the damn pink flowered yellow leaf ones. I mean come on yellow and pink, Uck! If you want to get a decent sized birds nest spruce, expect to spend around $40-50.You can find these at almost any decent nursery. If you are cheap (and patient for them to grow), you can buy them in a 1 gallon pot at a big box store for $6 plant them and forget about them for three years (well other then watering them of course). Since it has a shallow spreading root system, it transplants easy. It prefers full sun but will do fine in part shade. As long as you have average soil and give it adequate watering for a couple of years after you plant it, it will be fine. Once the roots have become established, the plant will be able to handle periods of drought. Poorly drained wet areas or areas of full shade are however no no’s. It also is relatively free of most insect and disease problems, although you should keep an eye out for spider mites. DEER are NOT interested in it usually. Lots of evergreen trees and shrubs can be used to add winter interest, such as boxwood, mugo pines, etc. If you forget to get your pruners out every once and a while, they can sneak up on you and grow a whole lot bigger than you want. Birds nest spruce will not do this. In fact, I didn’t prune one I planted for six years. As someone that aesthetically prunes trees and shrubs almost every day, I appreciate that shrub letting me kick back and relax a bit! If you are still concerned about it out growing its spot, let me assure you it is easy to control its size with a little pruning every couple of years. The birds nest spruce has fine foliage and a flat spread that combined with a dip in the middle makes it look like a bird’s nest. 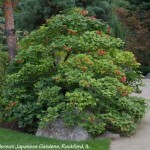 It has horizontal branching helps to “ground” it in the landscape . Vertical elements like tree trunks are great, but without lower growing mounded types of plants, like the birds nest spruce, gardens can sometimes not look settled into the landscape. No it’s not a specimen plant that’s going to be the focus of a garden area. It does however serve as a nice accent plant that adds four season interest and can be used throughout the landscape without becoming overdone. 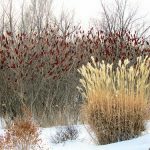 I have had a few readers ask me about possible plants for planting at a cemetery. The bird spruce provides enduring evergreen foliage that can be symbolic of feelings for a loved one that has passed. That with the ability to be kept small, makes it a possible plant for that use. 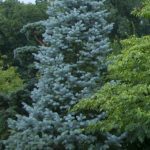 Although I think an even slower growing version of this plant, like Picea abies ‘Little Gem’® may be even better if planting space is limited or you never want it to need pruning. After a birds nest spruce has been growing for a bit, it can be a great plant to prune out in a Japanese garden style to reveal its branching. 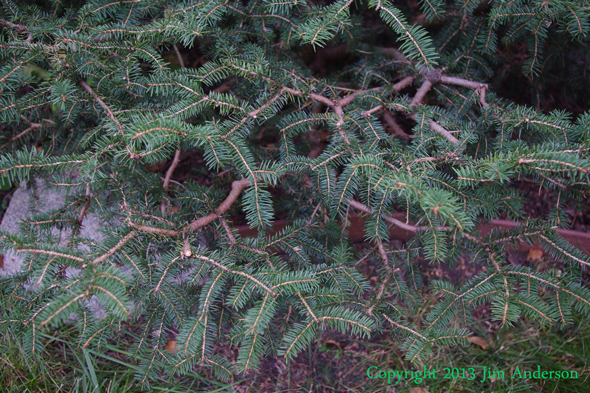 If you would like more info on this dwarf spruce, see this American Conifer Society’s webpage. If you liked this post and want to be notified when I post a new one, sign up below. 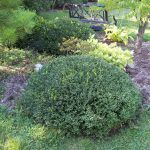 What is the best evergreen shrub for your foundation? Your comments about the Bird’s Nest evergreen was very helpful. I’m thinking of buying 3 of them to place in front of a double window in the front of my house. The windows are tall and only about 2 feet off the ground. I don’t want to block my view so the Bird’s Nest evergreen sounds like it might be a good solution. The low growing juniper that is there now seems to be dying. They are about 30 years old and has seen better days. Thank you, I look forward to more helpful information. I will be pruning my blueberries soon and will be doing research on that. I have had these for years and are great plants. My biggest problem is rabbits in the winter. They love to live under them and since they grow low to the ground, the rabbits chew access holes in the plant. They also can get spider mites in some years. Easy to take care of with a little insecticidal soap as long as you keep an eye out for them in spring and fall. You can but don’t expect it to grow from old wood much. I would leave it or just tidy it up a bit and see if it flushes any new growth from wood. Thanks for pointing that out. I did fix the article, but I would say this is a good one for you as it will take decades to grow larger the 3′ tall. I have some birds nest spruce that are doing well on the north side of my home and have grown slowly as promised. They recieve some sun since they are spaced a few feet away from the foundation (and bay window), my problem is that the tall hostas that used to grow behind the spruces and in front of the house all died at once. Last year I filled in with some overly tall autumn joy sedums, but I’m looking for a suggestion for something that will grow in that really shady spot. And additionally, can I prune the spruces for height? Can I upload a picture? Yes you can prune them, just start lightly and see how they respond. Then next year you can prune them a bit more to bring them in a bit more. As far as plants for the shady spot, you might want to try some ferns. I would avoid Ostrich and Hay scented ferns as they can spread a bit to way too much. Christmas ferns are some of my favorites that can handle dry shade and stay put where you plant them but Rhett are lots of other ones that are nice. The County up here just outlawed all yews with the towns to soon follow suit due to several elk deaths over this last winter. We range from zone 2-4 depending on location in the valley. I’m looking for a suitable evergreen replacement for area’s with little to no sun. Will the Birds Nest Spruce survive under these conditions. The yew’s I will be replacing on our clients properties are primarily Tauntons Spreading Yew. Zone 3 is the usual hardiness zone most sources give. Is there snow cover most years. If they are reliably under a few feet of snow, they should be fine. Sounds like a plant to try in protected spots near foundations, etc. As far as the low light levels. They need at least some light, they are definitely not like yews in their tolerance for full shade. I’ve relied on Birds Nest Soruces for over 35yrs. Beautiful low shrub getting to 8-10 feet in diameter. Last year was the 1st year the deer ate them. This winter (’15-2016) I sprayed & fenced them off with 6 Foot wire fence. Planted 4 Nest Spruces (about 3 gallon size) in May and they are quickly turning brown. Would watering be the problem -too much or too little? How often is appropriate? Thank you. I just purchased one this Spring, hoping that I could leave it in its original pot and it would survive the winter months in my urn. Do you think it will be ok in Zone 4, being left outside in its pot? It is hardy down to zone 3, so it might be iffy as I usual consider plants in pots to be two zones colder then the zone they are in. So a zone 3 hardy plant would be OK in a pot down to zone 5.